‘PictureMe’, a collaborative effort between Tyler Nettleon and Filippo Bigarella, is a new camera tweak for jailbroken iPhone and second generation iPad devices that allows users to set a timer for their camera and take multiple photos in rapid succession. The “Time Delay” feature lets users set a custom time between 0 and 25 seconds. This lets you set up the camera, hit the button, and still have time to jump into the frame. Such functionality comes in handy for group shots where you want to set your camera and then walk around to the front to get yourself in the photo. While most digital cameras sport this feature, it’s something the standard iOS photo application can’t do. The “Rapid Shot” setting lets users take up to 5 photos in quick succession. 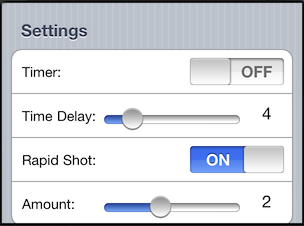 The timer and rapid shot features can’t be used at the same time. ‘PictureMe’ is available for $1.99 in the Cydia app market.